It is with heavy hearts that we announce the sudden passing of Esther Gohl on Tuesday, January 22, 2019. Esther was born on September 28, 1923 on the homestead north of Margo. Her father moved the family into Margo and started his shoe repair business. After Esther’s Mom died at an early age, Esther remained at home to help her Dad raise her younger brothers and sister. She remained in Margo where she raised her daughter Rita. Esther loved visiting and was always at the café in Margo every afternoon when the café was open. Rita sometimes had trouble getting a hold of her Mom because she was off visiting somewhere. This earned her the nickname of Gallivanting Esther! Many cups of tea were drank in the evenings at Sadie McChesney’s or Lizzy Juve’s. Esther started having trouble getting around, so Rita moved her to Weneeda Lodge in Wadena in 2004. 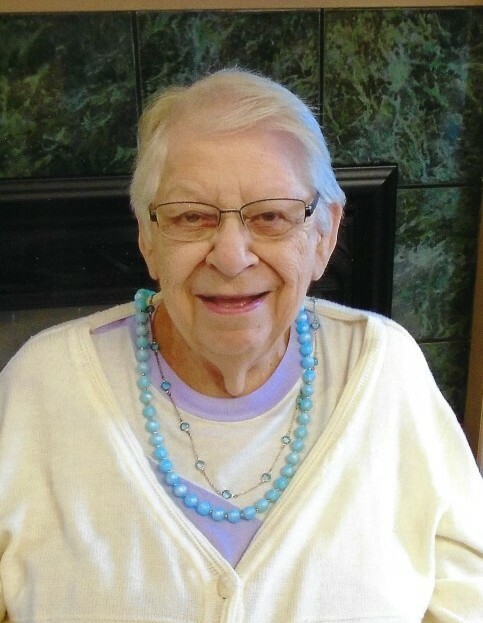 She enjoyed her time there but once again her health started failing so she moved to the Gateway Lodge in Canora in July of 2016 where she remained until her passing. Esther adjusted well to the lodge and enjoyed all the activities that went on there. Esther is survived by her daughter Rita (Ken) Hall, their daughters Denise (her daughters Payton and Ashlyn) and Michelle (Andres), sister-in-law Joan Gohl and her family, niece Karleen (Jim) Wiese and their family and nephew Bill (Lynn) Row. Esther was predeceased by her parents Emil and Martha, a sister in infancy, sisters Bernice and Elsie, brothers Elmer, Dennis, Melvin and Bernard and brother-in-law Cliff Daw.